This is the best use for a time machine ever! I would humbly submit that using your time machine to finish all future work at some fixed point in the past would be even better. Since all prior future tasks will have now completing at one future point in past time, you no longer have to do *any* work in the present, because everything’s already happened… unless it didn’t because you thought it did which caused it not to so it ended up not happening because it actually did. I have been wanting to do that since I was a child and had to wake up for things. It is still something I want to do… everyone else might wonder why I would appear to age so much faster, though maybe getting sufficient rest would make it appear less obvious. I’m up @ 3 in the morning to get ready for work M-F.
Oh my goodness… If I had a time machine, I would probably trap myself in a loop on purpose, as long as the “progress” I’ve made is still there when I go back in time again (so that all the creative stuff I’ve done isn’t lost every time I repeat the time machine process). Sometimes I think you can read my mind. I’ve had this exact thought. 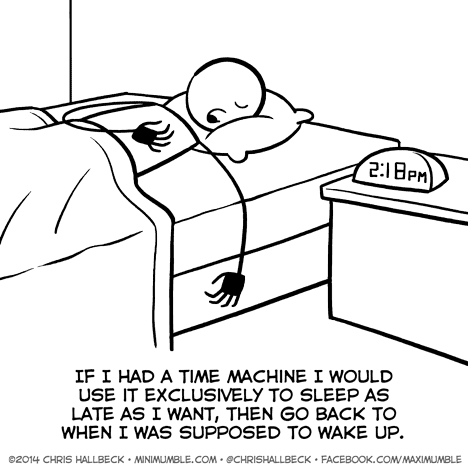 Every time I pull an all-nighter, I wish for time travel powers.